I know it doesn’t have a cover. I know it isn’t even in the genre I prefer to read. No, this book was simply found in a box marked FREE on Highway 47 as my husband and I drove further north to Lac du Flambeau. 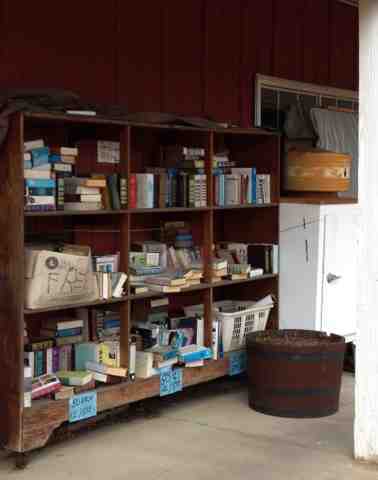 I could find a bookstore anywhere. The day was rainy and gray, hence the road trip away from our cabin in Pickerel Lake. We bundled into my red VW Beetle and traveled little byroads into civilization. “Stop!” I yelled as we came upon the sign. For the contents looked promising. However, the shop was closed on Sundays and Mondays, much to my husband’s relief. 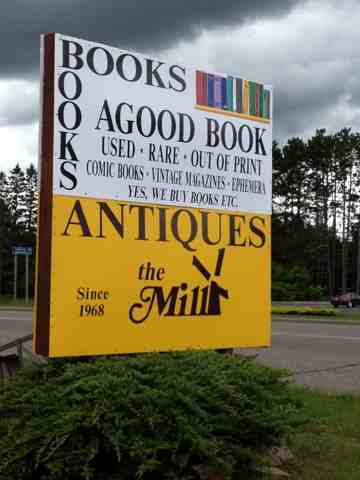 No perusing through stacks of antiquated books in the hopes of discovering an unappreciated treasure here. I had to content myself with the piles on the shelves exposed to moist Northwoods air. 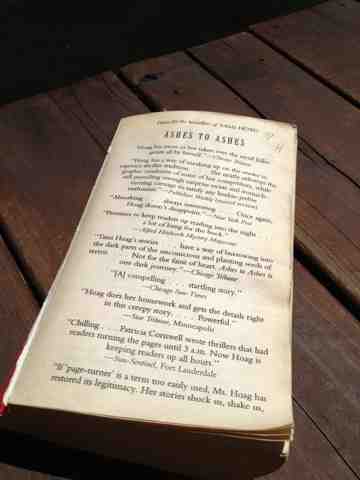 But, as I picked up this thriller by Tami Hoag, Ashes to Ashes, I felt a thrill other than an author could provide. I felt the the heft of pages worn by time and weather, as well as other hands. I smelled the old glue, and wood pulp, and bits of moisture before they turn to mold. I relished the cost of this book ($0.00) which is priceless when compared to the e-ink on countless e-readers which harbor no imprint of people at all. Oooo free books are the best and you're right. There is an inexplicable charm to worn paper paperback books. The notes in the margin comments are so true! Recently (for convenience sake) I've read a couple of e-books, but you are so right — they don't have the same feel. I like the notes in the margins– I like to know what other people are thinking while they read. Is this book missing it's cover? It looks like it is. I know that those books are supposed to be free. Usually they come from book stores who were reimbursed for a book that wouldn't sell. I worked at Barnes and Nobles for a short time and they would mail all kinds of covers back to publishers. They would give the book without the cover to any of the employees who wanted it. I loved it so much. I miss it! What a fun outing. I can just picture you heading back to the woods, perhaps lighting a lamp and sitting on the porch, reading as the storm blows through. I visited a few quaint “indies” while exploring the islands around Seattle, but my only purchase was a birthday gift for my stepmom. When do you return? We're currently in Chicago (Midway airport) awaiting our flight home. We had such a lovely time. Wishing we could find a way to move to Bainbridge Island…. A real, actual find! And it's a book book. Enjoy! Sounds like fun. Too bad the store wasn't open, but you got a treasure for free.